Anyone else doing this? I'll be running it for the second time, hoping to get a Championship qualifying time for London (missed out by 7 seconds at Manchester this year!). I'm looking forward to getting stuck in to training in a few weeks. I will be running it. My first marathon in Eu and first one in a few years. I’m based in USA. How was the race for you last year? runspoonrun - 7 seconds, that's cruel. reversethrust - hope you enjoy your first race in EU. I'm doing Frankfurt too, going with a group from my running club. Not run this race before so can't help with any race info but I've heard great reports about the race. reversethrust I ran in two years ago, it's a great marathon, very well organised and a very fast course. There are a couple of pinch points early on where you can be slowed to almost a walk, but they quickly pass so just don't panic. The tall buildings near the start can also mess with GPS, so don't let that throw you. As Wardi says, the finish line is incredible, a real barrage on the senses at the end of a marathon! runspoonrun - oh that's a shame, PF is a swine to get rid of. 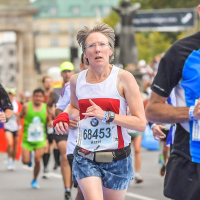 all - thank you for the insider tips on the Frankfurt Marathon. I’m used to drinking Gatorade and have never tried the Rosbacher isotonic drinks. Runspoonrun - hope you recover from your injury soon. reversethrust - can't help re the sports drinks, I can't use any they don't suit me. Thanks shades, I've been gradually building back up and it's slowly getting better I think. I'm afraid I can't recall much about the drinks, reversethrust. They give you a voucher to get a free sample when you collect your number, so you can at least try it prior to the race. Than they are supplied in cups on course, so it can be quite awkward to drink when running. Definitely worth practising. runspoonrun - were you able to defer your entry to Frankfurt? It was easy to find a hotel within 10 minutes of the start and a similar distance to the train station. The start being at around 10am meant I didn't have to get up ridiculously early. It was harder finding a decent meal the evening before without travelling into the city itself. The Möwenpick hotel did a marathon buffet but I wasn't so impressed by the quality, maybe I got there too late. Pre-race it was busy around the start but I always had space to do my thing, be it drop off my bag, do a brief warm up, visit the loo without a massive queue, get into my start block etc. 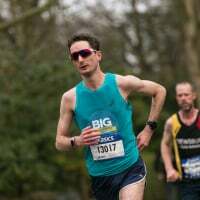 I also found the first couple of miles a bit crowded but as of then always had plenty of space to run my pace (be aware of the marathon relay race meaning that you might have runners blast past at a considerably faster pace). The crowd support was good in the city, a bit sparse on the long loop out to the west in places. The loop does drag on a bit - in particular the couple of straight miles along the Mainzer Landstrasse (km 30 - 34) on the return. I didn't find the course itself to be particularly scenic. If it is windy then it can get pretty gusty around those tall buildings. It is a flat course, I remember a couple of minor humps over the river bridges and a short ramp up to change from one road to another. The finish line itself is something special. To get to refreshments, medal, blanket etc you need to go back outside again. If I remember correctly there were steps involved but helpers to stop people falling over! Good luck to all running! HazelnutCH - thank you so much, that's really helpful. I'm going with a group, they're all staying at the Möwenpick except for me, my hotel is close by though. I'll do a bit of research re places to eat, luckily we're arriving on the Friday so will have a bit of time to look around and find somewhere suitable. Hi Shades, I did Frankfurt last year and loved it! Food wise we found a reasonably decent Chinese Buffet, Yanjing Buffet Restaurant, 62-64 Kaiserstrasse, two minutes walk from the main station! Well I loved Frankfurt marathon. Flawless organisation. City marathons aren't always my favourite but I found that within 2 minutes of starting I could run without that edgy claustrophobic feeling that you usually get in big marathons with other runners a little too close for comfort. Roads were wide and I could follow the blue line without having to move from side to side. Slightly annoying the relay runners shooting past but there was no bad feeling as I found the atmosphere of the race really good, helped I think by very few runners with headphones. It was a chilly day and a little windy but not really bad enough to have any effect, new women's course record of 2:20. The finish is spectacular. Hot soup at the finish which had a generous helping of salt which definitely made for a speedy recovery, giant pretzel too. Lovely medal. Enjoyed the Expo too the day before. My hotel was 2 mins walk to start/finish. Hotel was next to the Skyline shopping centre, loads of places to eat. We used a steak restaurant across the road twice and a great Italian 10 minutes walk away that one of my club members had pre-booked for a late lunch on Saturday, was very good. Will definitely go back again. Good fast course, 2 of our group did sub 3, one getting a championship time for VLM. I think this race is an ideal alternative to Berlin.